The Vintage SAAB Information Source! Welcome to the original VSAAB, a treasure trove of vintage SAAB information. 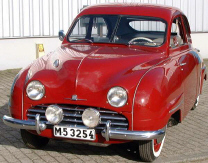 If you are an enthusiast of early SAAB automobiles, VSAAB is for you! Own them, drive them, love them! Mailing List Subscribe to the Internet's premier electronic mailing list pertaining exclusively to vintage (pre-900) SAAB automobiles! The SAAB 93 Registry With thanks to the intrepid Mr. Turk, the SAAB 93 Registry has a home here on VSAAB! VSAAB Gear The long-awaited VSAAB Shirts are here... and gone! VSAAB Angels Need help while you're tooling around the USA in your vintage ride? VSAAB subscribers submit their best launches! Two-Stroke Engine Identification Table Do you think that three-banger you found might be a GT or Monte Carlo variant? Check here to find out for sure! Vintage SAAB Parts Interchange Table Finding quality parts for your early SAAB can be a challenge. With VSAAB's Parts Interchange Table, you'll find alternate sources of parts that will help you keep your car running forever. VSAAB contributor Bruce Turk has collected this list of SAAB part numbers for many of the common replacement parts we need to keep 'em running! VSAAB Articles How-to's and non-technical essays on the vintage SAAB ownership experience. Index of Ads, Road Tests & Magazine Articles Thanks to VSAAB subscriber Bruce Turk, an index of vintage SAABs in print! Survey Page Give us your opinion on issues dealing with VSAAB & The Vintage SAAB Mailing List -- New questions every... umm... once in a while! The 1971 SAAB Sport & Rally Catalog Take yourself back to the heady days of SAAB V4 rally competition! Check out the website of the San Diego SAAB Owner's Group, the home of VSAAB in sunny San Diego, California USA! Help keep VSAAB alive and well! If we've been helpful, entertaining or even (gasp!) saved you some time and money, a small donation would help keep our costs under control. THANK YOU! If you're really feeling plucky, here's a way to make a small monthly donation to VSAAB, automatically! Click to the left to donate US$5/month to your favorite vintage SAAB site! ©VSAAB, 2016 All rights reserved. VSAAB is not affiliated with SAAB Cars USA or SAAB Automobile.